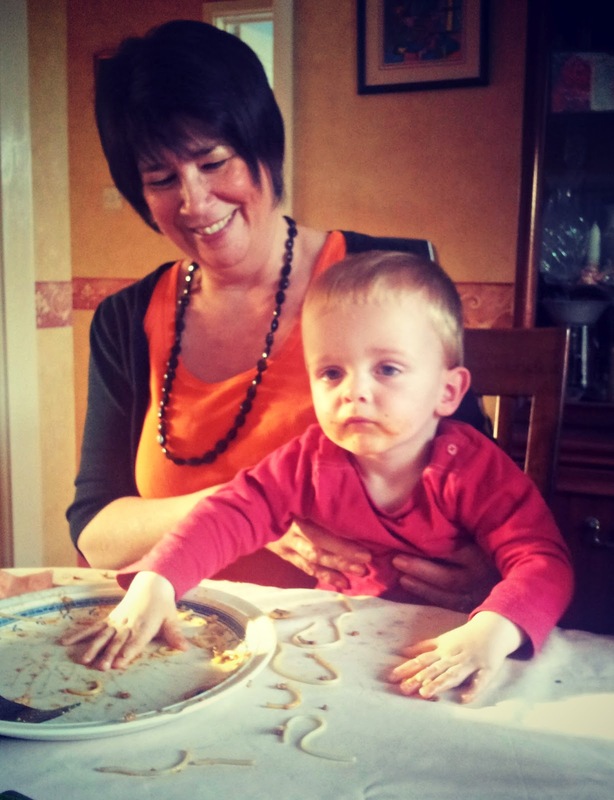 Johnson babies: Children's Theatre: Not your usual afternoon tea! I think I had one of those days when Squeaks was a baby and was in need of retail therapy of the book kind. We ended up with a stack of books, all with one thing in common- they were my favourite as a child. 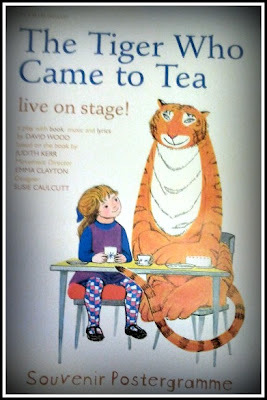 On top of the list was "The Tiger Who Came to Tea" by Judith Kerr, along with Kerr's other books featuring Mog the Cat. I don't know if my parents have these books to blame for my first pet being a kitten, but now as we snuggle up at night to read these books I still love to how they trigger a little one's imagination and creativity. Hearing that your favourite book has been turned into a film, or a play, is never a good feeling. But fortunately "The Tiger Who Came to Tea" was a recommendation from a friend, so I was happy that we both snapped up tickets for an afternoon performance at the New Theatre, Cardiff. A lot was going against us in seeing this, Squeaks wasn't on form and I forgot the rugby was on. An inpromptu stop at the Park and Ride to get into Cardiff sorted the latter problem, only TLC could do pacify the former. 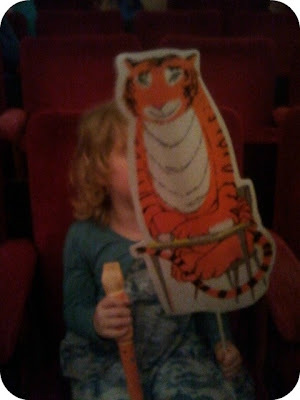 Children amaze me, we had the claim of being afraid of tiger, followed by a request for a tiger flag; not wanting to go to the see the Tiger, but wanting to see Sophie; wanting to go home, but we had to go to the theatre; the list went on. I felt a small sense of achievement as we took our seats! Squeaks was of course mesmorised by the performance, fortunately for my enjoyment whilst the performance lasted near to an hour (and I've never managed to make the book last that long) it remained completely true to the book. The additions were well placed, all encouraging audience participation- something children's theatre has to be about. We (me) enjoyed singing along and learning actions to a song, Squeaks was watching intently/ poorly throughout, she did enjoy it- testament to which she never asked to go home once after the performance started and even moved to sit on my lap to get a better view. The one thing I would say, is I think we had good seats in the stalls; I don't think seats in the circle or upper circle would have made for such a good experience, with only three actors and lots of interaction it feels like a very engaging piece of theatre; although contradicting myself it is 'direct from the West end'.... I just don't think I'd be fussed on trying to ensure a good view in a big theatre. 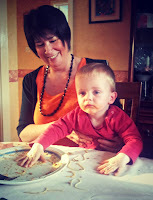 As the babies are now 'baby-led weaning' whereas we are trying to encourage Squeaks to use cutlery and eat at the table, we have recently been using the book to reinforce this, and every time the Tiger "Owp"'s the food without any manners we have been reinforcing this- seemed like a good idea at the time. Every time it happened today it turned out it was only Squeaks participating as she kept calling out "Naughty Tiger". I loved "The Tiger Who Came to Tea", recommended for children over 3, this is a great reinforcement of the book, and equally enjoyable in isolation of the book. I loved that it effortlessly lasted near to an hour, and that it was engaging, enjoyable and perfect as theatre for little people. If you want to see if The Tiger will be coming for tea near you, check here. Disclaimer: This is not a sponsored review. We purchased tickets for the performance and wanted to share an opportunity for little ones to experience great theatre.